The notion of separatism can be interpreted in different ways, however, no country is impervious to it, and Ukraine hasn’t been left untouched either. For several years we have already been able to observe the manifests of separatism in our country, which determines its territorial and morale dissolution, but one way or another, in the view of rise of such a global problem, it is important, despite of the contradictions among people, to act and to think according to our conscience and, thus, according to moral. So today one of the greatest problems in Ukraine is separatism. But why has it appeared? And what consequences does it bring? Separatism is a detachment of a certain territory from the whole state on absolutely legal grounds, which looks like an autonomy or an integral state. 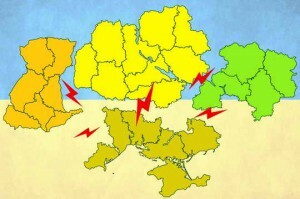 This is how Ukrainian south region looks now. The beginning of separatist movement has to be searched for,first of all, in socioeconomic conditions of the country as well as in its independent political position. But the top-priority task for politics of such a young state as Ukraine has to be uniting the society around a common goal – country development in all aspects. But it happened vice versa, as a matter of fact, the society lost its unity despite the love to their Motherland. Why is it so? I think there may be many reasons. One of them is ethno-cultural differences among the regions of the state. In western Ukraine people have their own customs, traditions, culture, in eastern Ukraine they are different, and another important barrier is a language aspect. Controversy around this issue has lasted for many years, but the existing variants of solution for this problem do not satisfy any of the parties. Both parties defended their language and culture, which caused enmity and internal conflicts within the state. Instead of coming to a compromise and making their state stronger and more advanced, the situation became worse. But the major reason for separatism in Ukraine is interference of the Russian government. During all years of independence Russia interfered Ukrainian politics, thus creating its own rules on Crimean territory in many different ways, starting with political manipulations and ending with ethno-cultural influence on the Autonomous Republic, and as a result, it affected the annexation of Crimea. After loss of Crimea, regional situation in Ukraine only became worse. Various meetings and maidans were created, where citizens defended their own position, but not the position of the state. Lack of unity in society affected the state’s inner situation and its notional fragmentation. In doing so, Russian authorities continued their so-called plan, which was accompanied by the following:Russian media said that Ukraine oppressed Russian-speaking citizens in Ukraine and Russians in their rights, which, as a result, forced them to separatism on the East of Ukraine. Therefore, Russia sort of took a side with eastern Ukraine. Having felt that, citizens continued their protest in a louder and more large-scale movement in order to separate. This is what served to emergence of separatism in Ukraine. That is why, relying on this, we can say that main reasons of separatism in Ukraine are: peculiarities of Ukrainian population, economic, cultural factors of country’s regions, influence of other states, improper central authority and terrorism. But has the situation in eastern Ukraine improved after the occurrence of separatism? Does Russia support them in the same way? In my opinion, the answer to this question is obvious. Separatism has caused serious consequences not only for the Eastern part, but all over Ukraine. Battle actions in the East, in which Russia, which initially seemed to be helping and supporting Eastern Ukraine, is our rival itself now. Here they are, the consequences of separatism. Thousands of victims, refugees, sufferers, destroyed towns, districts, cities are a proof of it. Hopes and expectations for detachment of Donbas from Ukraine and better life have not become true, the situation has only worsened. But despite the emergence of separatism society is making all possible efforts to preserve the unity of the country and its integrity not only in territorial terms but also spiritually. However, despite this situation, in the East of Ukraine, there is still a certain percentage of people, who support separatism and Russian government, blaming Ukrainian central government for everything. Perhaps, this is followed by the belief in promised improvements, perhaps because of the banal stubbornness and inability to understand all seriousness and global character of the issue, and in this case – separatism. Unfortunately, for all the time separatism exists in Donbas central government hasn’t taken any action to eliminate it,now, however, absolutely different picture can be traced from the position of the citizens. Despite conflicts and divergences in views, the society is finally uniting. This is where moral manifests itself. Although separatism and difference between East and West are present on the territory of Ukraine today, and it appears in distinctions between regions in cultural and ethnical aspect, there is still something which they have in common. It is real love for their country.